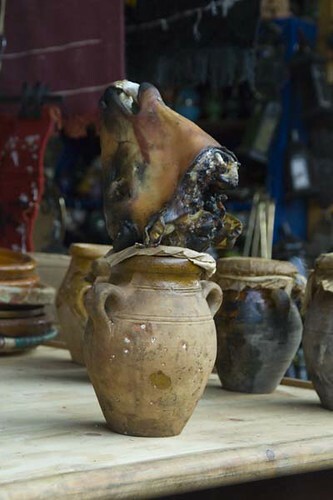 During Morocco’s long history many, many different visitors, invaders and settlers have influenced it’s cuisine which is, today, a mix of Berber, Moorish, Middle Eastern, Mediterranean and African cooking. The other major influence, of course, is the availability of produce which is dependent on the climate and the fertility of the land – Morocco is blessed in both departments. Morocco produces a large range of food itself including sheep, poultry, cattle, seafood, a great many fruits and vegetables (including citrus) as well as saffron, mint, honey and olives. Other spices such as cinnamon, cumin, tumeric, ginger, pepper, paprika, sesame, coriander and many more have been imported for hundreds, and in some cases even thousands, of years. Foodie travellers may want to pick up some harissa, a fiery paste of garlic, chiles, olive oil and salt and some ras al hanout spice mixture which combines anywhere between 10 to 100 spices – sellers are proud and secretive about their exact recipes. With the exception of Ramadan, the main meal is traditionally taken at midday although this custom is changing due to the habits of visitors and more recent immigrants. The meal typically starts with a series of hot and cold salads or appetisers (often referred to as a salade marocaine or meze). The bread, eaten at virtually every meal, comes out at this stage. 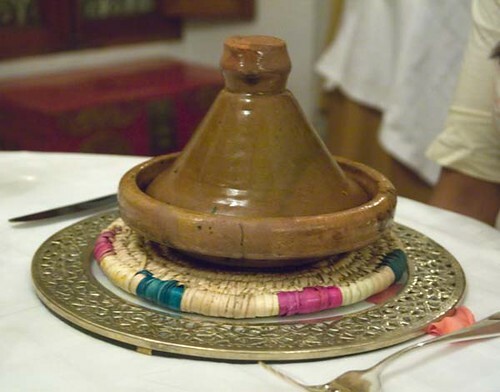 The tagine comes next in it’s signature cooking dish (though these days many restaurants serve up in individually sized serving versions) – it is essentially a slow-cooked stew and the combination of meat with fruit is quite common. This is followed by couscous (a ground semolina pasta shaped into miniscule grains) topped with either meats or vegetables and a delicate gravy is sometimes served with it. Desserts aren’t eaten regularly – instead most meals are ended with either sweet mint tea or strong coffee. Another dish you may come across is pastilla, a delicious sweet-savoury pastry made with pigeon, cinammon, sugar and filo pastry. Harira, a thick traditional Moroccan soup, usually eaten during Ramadan to break the day’s fast, is a hearty meal in itself. One of our favourite dishes was the Moroccan roast lamb or mechoui which was so tender that the meat truly did fall off the bone. Sweet pastries tend to be served during breaks rather than after a meal and include sugary pastries stuffed with almond paste, moist honey cakes which are deep-fried, pretzel-shaped morcels of dough dipped into honey and sprinkled with sesame seeds, a sweet semolina paste known as halwa and a range of biscuits (cookies) and cakes. I’ve already mentioned the ubiquitous sweet mint tea served in tiny glass cups and often poured from a great height by seasoned servers. Visitors to Marrakech who are a little tea-ed out might enjoy freshly squeezed orange juice in the Jemaa El Fna Square at a government fixed price of only 3 dirhams a glass. Speaking of the Jemaa El Fna Square it transforms in the evening into a vast open-air array of street food vendors selling a huge range of food from soups, to skewered meat kebabs to items most Western visitors won’t even recognise (or want to)!